Former manager Colin Lee has returned to Torquay United after being appointed as the club's chief executive by new chairman Alex Rowe. 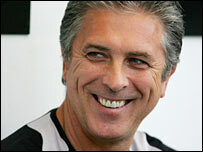 Lee, who played for the Gulls in the 1970s and managed the club for a spell during 2001, returned in February as director of football. However, he was then made redundant by the club earlier this month. Rowe is part of a consortium which completed its purchase of the club from former owner Mike Bateson on Thursday. As well as Rowe and new vice-chairman Simon Baker, the consortium also includes Cris and Mark Boyce, Paul Bristow, Tony Carter, Eric Coote, James O'Dwyer and Ian Hayman. Lee's first priority will be to appoint a new manager, following the Gulls' recent relegation to the Conference. Since February, Lee had been director of football, working alongside head coach Keith Curle. But following relegation from League Two, Curle was told that his contract would not automatically be renewed, and he was invited to reapply for the role. Leroy Rosenior was unveiled as manager on 17 July but then informed 10 minutes later by Bateson that the sale to Rowe's consortium had been agreed and that he would not be staying once the takeover had been finalised.